Featured Song "Slippin' and Slidin'"
"The Beauty of Kootie" is the fourth episode of The Adventures of Super Mario Bros. 3; it aired alongside another episode of The Adventures of Super Mario Bros. 3 entitled "Mind Your Mummy Mommy, Mario". The Sultan of a desert region is at home in his palace, taking a bath in his jacuzzi. Suddenly, oil comes flowing out of the camel head-shaped faucets, and the Sultan reacts by calling for his guard, asking him to send for the Mario Bros. When Mario and Luigi arrive, they manage to patch up the faucets, at least to prevent any more oil from flowing out. Toad asks where the oil is coming from, so the Sultan tells him that his palace is built over an oil well, and that the pipes connecting a nearby oasis to his castle must have gotten crossed with the pipes from the oil well. After experiencing a tremor caused by the oil pressure, Mario explains that they need to fix the palace's plumbing to prevent the place from blowing up. Meanwhile, in the basement of the palace, Cheatsy is spying on the Mario Bros. through a peephole, when Kootie yells for his assistance in tightening the oil pipes that they've been tampering with. Cheatsy tells Kootie that the Mario Bros. are coming, so Kootie uses her wand to alert Bowser, who's onboard the Doom Ship. Bowser explains that they've nearly refilled the Doom Ship's fuel tank by secretly stealing oil from the Sultan's oil well by using the pipes from the oasis. Bowser then orders Kootie Pie and Cheatsy to stop the Mario Bros., and disconnects from the conversation. Kootie examining herself after being transformed. When Kootie Pie whines about not knowing how to stop the Mario Bros., Cheatsy comes up with an idea; he uses his own wand to transform Kootie into a human. 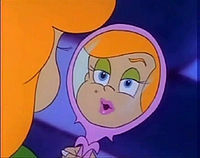 Kootie Pie is shocked, but Cheatsy tells her that by pretending to be Mario's "dream girl", she'll be able to stall him. Just before Mario and Luigi enter the basement, Cheatsy flees, and Kootie is too late to tell him that he left her tail intact. When Mario sees Kootie Pie as a human, she immediately starts flirting with him, and introduces herself as "Lady Fettuccine Alfredo". Although Mario falls in love with Lady Fettuccine, Luigi quickly notices her tail, which she frantically hides under her dress. Lady Fettuccine then makes up a fake story about being lost in the dungeon for days, and how Luigi shouldn't jump to conclusions. When Luigi tries to get a better look, Lady Fettuccine smacks him into a wall with her tail. Luigi gazing at Mario and Lady Fettuccine eating a spaghetti dinner. 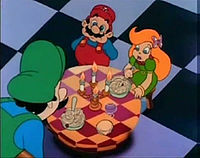 Mario then tells Lady Fettuccine to forgive Luigi for his behavior, and directs her over to a table where he's set up a spaghetti dinner for two. Lady Fettuccine tells Mario that's she an amateur plumber herself, and while Luigi barely believes her, he's reminded of the fact that he and Mario have a job to do. Lady Fettuccine forces herself to eat some of the spaghetti, and tells Mario to bring everyone in the castle down to the dungeon in case the palace explodes. After the Sultan, his guard, Princess Toadstool and Toad are led into the dungeon, Lady Fettuccine locks the door, and demands for Cheatsy to come out of hiding and turn her back to normal. When Mario sees that he really fell for Kootie, he can barely react before Cheatsy sprays him and Luigi down a hole with oil from a hose. Bowser and some minions enter the basement through a Warp Pipe, where he congratulates his kids for capturing the prisoners, and then mocks the prisoners as well. Bowser then goes upstairs, while he waits for the Doom Ship to finish sucking up the rest of the oil in the well. Mario and Luigi escape from the sub basement of the palace by opening up and entering a warp pipe, taking them up a floor to the basement. While Kootie taunts the prisoners, Mario and Luigi sneak up behind her and Cheatsy. Princess Toadstool keeps the Koopalings occupied while Mario picks up Cheatsy's dropped wand. Mario and Luigi run into another room, where Mario says that Kootie Pie should meet her dream reptile. 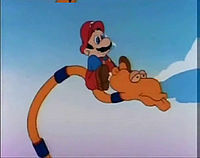 Mario uses the wand on Luigi, transforming him into a handsome Koopa (similar in design to King Koopa) that he calls "Casanova Koopa". Although Luigi tries to object, Mario makes him put on a deep and appealing voice while he takes care of the plumbing upstairs. When Kootie Pie sees Casanova, she falls in love with him, and they immediately start hugging and kissing each other. Casanova finds out that Kootie Pie's kisses are disgusting, though. When Cheatsy starts pestering him, Casanova pushes him out of the way asks Kootie if they can get some privacy alone in the dungeon. In an outrage, Kootie kicks the prisoners out of the dungeon, despite Cheatsy's objection. Kootie Pie explains that her dad only wants her to be happy, and uses her wand to change the dungeon into a living room. Kootie Pie jumps up to Casanova, and kisses him several times again, but in doing so, her wand accidentally transforms him back into Luigi. Kootie screaming after realizing that she kissed Luigi. After screaming about being tricked into kissing a plumber, Kootie and Cheatsy chases Luigi upstairs, with Kootie spitting out the germs from Luigi's kisses. When Luigi gets upstairs, Toad leads him aside, while Mario blasts the Koopalings with oil from a hose. When Bowser enters, he sends his Boomerang Bros. after the Mario Bros., but they got washed away by the oil as well. Bowser then sends several Fire Chomps after Mario, but Princess Toadstool sprays them with water from some pipes that Mario set up. After getting soaked with water, Bowser sends for the Doom Ship, which crashes into a wall of the palace. The Koopas board the Doom Ship and retreat out of the castle. Bowser uses the Doom Ship to start blasting the palace apart, and the Sultan asks for Mario and Luigi to stop Bowser before the entire place is destroyed. Mario riding on a jacuzzi faucet. Mario and Luigi direct a ton of oil up through one of the jacuzzi faucets, destroying a tower of the palace in the process. Holding on to the faucet, Mario rides it through the air, and directs it into the Doom Ship, soaking Bowser and the Koopalings with oil. Not wanting to stick around, the Doom Ship flies away, as Luigi shuts off the faucet, allowing Mario to land. The Sultan is still upset about his ruined palace, but Luigi then notices that one of the Koopalings left their wand behind. Luigi uses up all the power in the wand in the process, but succeeds in making the palace as good as new. With all that said and done, Mario calls first dibs on the jacuzzi, and runs into the palace. Luigi chases after Mario as he runs upstairs, claiming that he should go first because he fixed the jacuzzi. Mario explains that he had to ride it, and Luigi counters that comment by stating that he had to kiss Kootie. Able to hear the brothers' shouting from outside, Princess Toadstool and Toad laugh. When Kootie Pie is working on the pipe and calling Cheatsy, her coloring continually switches from light to dark. Cheatsy's head turns different colors on three different occasions. When Cheatsy says, "Tell that to the Mario brothers, Kootie Pie," his head is colored purple. Later, his head matches the color of body twice: when he says, "I'm not sure King Dad would like this," and once again when he exclaims, "Luigi!" after the Casanova turns back into Luigi while kissing Kootie Pie. When Kootie Pie lets everybody out of the dungeon, her head is not connected to her body. When Kootie Pie introduces herself as Lady Fettuccine Alfredo, her eyes are completely blue (pictured above). When Luigi is trying to spot Lady Fettuccine Alfredo, her tail is flesh colored. When Luigi is telling Mario that they have a job to do, his voice sounds like Danny Wells from The Super Mario Bros. Super Show. When Mario compliments Lady Fettuccine to Luigi, Luigi's sideburns are missing and his eyes are off-model. When Mario is riding on the jacuzzi faucet, the Doom Ship is green. Oddly, in the part of Boomerang Bros.' attack, they are replaced by Hammer Bros. when are taken by the oil. When Mario is sitting on the faucet, waiting to throw oil at the Doom Ship, it is orange, but when everyone is celebrating after Mario attacks the Koopas, it is grey. At the start of the episode, the Sultan has a purple shirt on. Later, when he gets struck by oil, it disappears completely. On the first shot with the table, there are two cups with purple drink inside. A moment later, when Lady Fettuccine Alfredo starts eating, one of the cups disappears. In one shot, the Sultan has no mustache. When King Koopa sees Kootie and Cheatsy, Cheatsy's eyelids are black and his eyes are yellow. His eyes go back to normal as he leans forwards, then change back to black and yellow when he goes back to his original position. 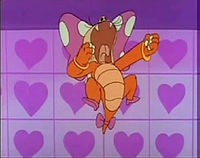 Kootie Pie's reaction to having been kissed by Luigi ("Aaaugh! I've been kissed by a plumber!") parodies a line ("Aaaugh! I've been kissed by a dog!") said by Lucy van Pelt in A Charlie Brown Christmas. This is the last episode which Mario's hair is colored black. For the next episode onward, his hair color was changed to brown from the later Mario games. ↑ May 20, 2015. "The Beauty of Kootie", dubbed in Romanian by KidsCo. Odnoklassniki (OK.ru). Retrieved January 4, 2016. This page was last edited on March 18, 2019, at 15:17.